The Idea Showcase table top show for distributors, where clients are invited! Note: This is not a show that is open to the general public. This is a show for promotional professionals. Distributor sales reps in the industry may invite their customers (the "end buyer") to the show, but clients must be pre-registered in advance by the distributor sales rep. Clients may not arrive on site without being pre-registered or in the company of their specific distributor sales rep, who may register the client on site for an additional fee. Clients arriving must check in giving the distributor sales rep's name that invited them. If clients are not registered in advance, they will be turned away unless the distributor sales rep meets them at the registration table to coordinate an on-site registration. Take exit 115 from 35E in Vadnais Heights. Turn onto County Road E East. Travel approximately 1/2 mile to LeBore Road and turn right. Jimmy's Conference Center Parking Lot will be on your right. Note: Do not turn into the strip mall off County Road E and LaBore Road for the venue called "Jimmy's Restaurant" . From the East: 35E South to the County Road E exit (right before the junction of 694 and 35E0. Turn left, go over 35E. Drive for 1/2 mile and turn right onto LaBore Road. The venue will be on your right. Look for a large parking lot and the "Jimmy's" sign. Distributor sales professionals, alone or with their clients. This is a table top show where you can meet with some of your favorite suppliers in the industry . . . and bring your clients if you like! Exhibitors | $225 for the first table; $150 for additional spaces. Rent a Table ($100) - distributors can rent a round table (seats 8) in the lobby area to meet with clients (option available during registration). Distributors may attend alone or with clients. Trying bringing "Just One!" Just one client can change your experience at this show and result in more orders. We've seen it happen. Skeptic distributors attend alone, and then decide the next year to bring a client . . . with great results! Try it - "Just bring one." Other distributors bring many, but if you're not sure, just try bringing one customer and see how it goes. We think you'll be amazed. Note: Clients may attend the Show without their distributor rep on site if they are pre-registered by their distributor rep. Clients may not arrive on show site (unregistered) without their distributor rep and expect to register upon arrival. To register clients, distributors may purchase badges (so specific individuals do not need to be registered). Clients arriving on show site must know the name of the distributor who invited them. We ask that distributors greet their clients at the door, if at all possible. UMAPP), the client's industry, and the distributor's company name. Clients will hand write their first name on the badge when they arrive. There is a restaurant on site if you would like to go to lunch. Jimmy's Restaurant takes reservations: 651-482-1100. There are 82 tables in the ballroom, with approximately 60 exhibitors attending. There are no refunds for registered clients who do not arrive on show day. The charge for all pre-registered clients stands as of the registration deadline. Beverages will be available (coffee/tea/ice tea/water). There is a restaurant on site; please make reservations at Jimmy's Restaurant (651-482-1100).in advance. Contact your invited customers a week before the show, reminding them to attend. * Distributors will purchase a block of tickets for their end buyers. When the clients arrive on show site, they will check in under their distributor sale rep's name and will receive their ticket (name badge). They will then write their name on the badge, along with their induistry. The badge will be pre-printed with "Invited by "X" distributor". This solves the problem of last-minute client changes. End buyer events have been growing in popularity across other regional associations. Many of these events have matured into successful formats resulting in superior member benefits for both supplier and distributor members. UMAPP has carefully selected and combined the most successful methods from each of these shows. Don't miss this unique opportunity to meet with your distributor customers - and their customers - to promote your products. 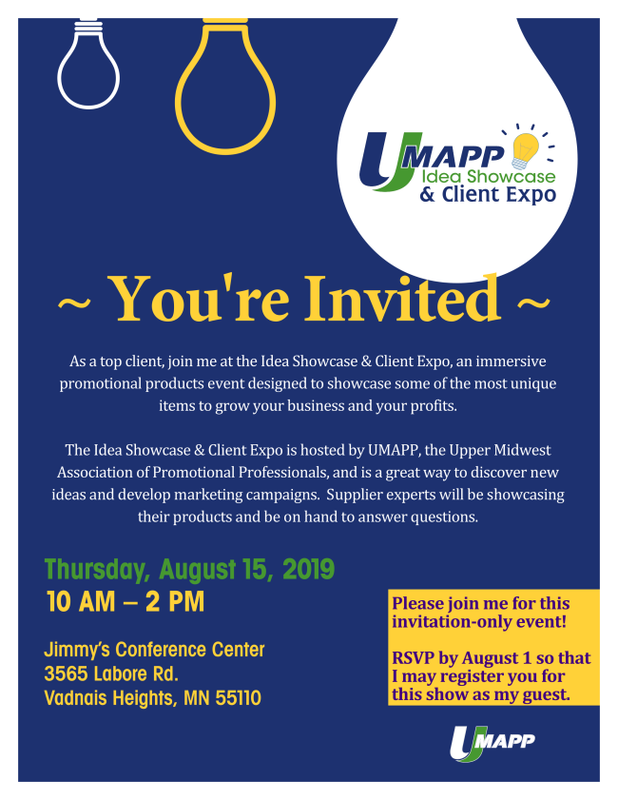 Connect with UMAPP's distributor members and/or their clients to showcase products for that important 4th quarter. Space is limited, so register early. 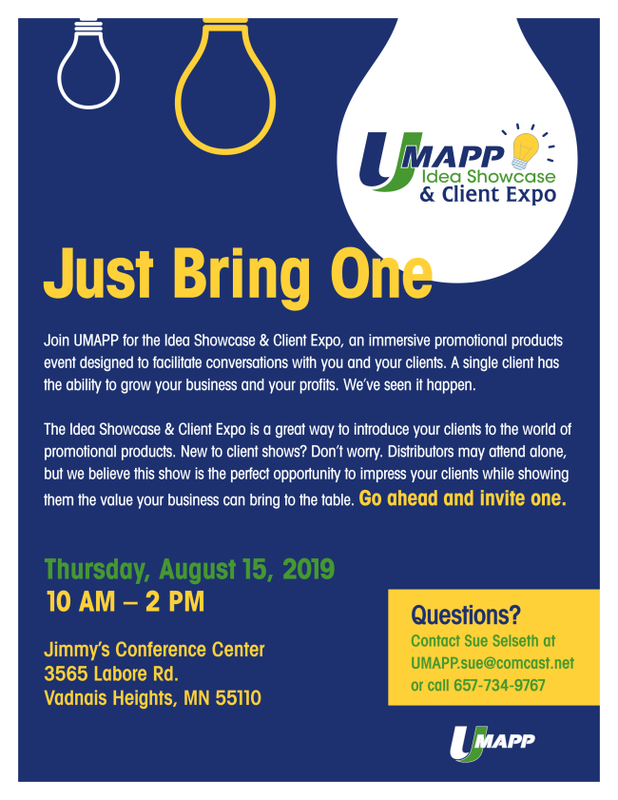 Held at Jimmy's Conference Center in Vadnais Heights, Minnesota, this event is one not to miss. Since the inaugural show in 2014, this event continues to grow in popularity. In 2015, over 340 distributors and end buyers attended. Set up is August 15 from 7:30 - 10 am. Set up the evening before is possible; keep you posted. All exhibitor companies must be current UMAPP members. Multiline reps do not need to be members of UMAPP to exhibit, but all of the lines they plan to exhibit do need to be members. Set up begins at 7:30 am on August 15 (show day) - if the venue is not rented on August 14, we will likely be able to have set up for a few hours later in the afternoon. More to come on that issue. Exhibitors receive one free boxed lunch; additional lunches can be ordered by August 9 for $15.00 each. Nonmember Distributors are welcome to attend (with restrictions - see above "Who Should Attend?"). Please direct your customers to this website page for full show information. Jimmy's Conference Center is approximately 20-30 minutes from the airport. Boxes (no pallets) may be shipped in advance to arrive on August 13 or August 14. Shipments received will be available on show site and you will be responsible for moving it to your table. Call in your shipment before leaving the show floor - UPS and FedEx will pick up the next day. Place your collapsed boxes on your tables or the floor after the show. Please try to limit the amount of return shipping; space is limited at the venue. Each exhibitor MUST TAKE DOWN THEIR OWN BOXES and leave them on the show floor before leaving. This is a venue rule. Holiday Inn Express & Suites, 1100 East County Road E, Vadnais Heights, MN 55110. Attached to Jimmy's Conference Center via covered walkway. Guests must cancel three days prior of the night of arrival to avoid any cancellation charges.